Summer is officially here. The sun is out, and a well-deserved vacation is hopefully on the horizon for our readers! You’re probably yearning to pull your car top back and down already, and we’re right there with you. 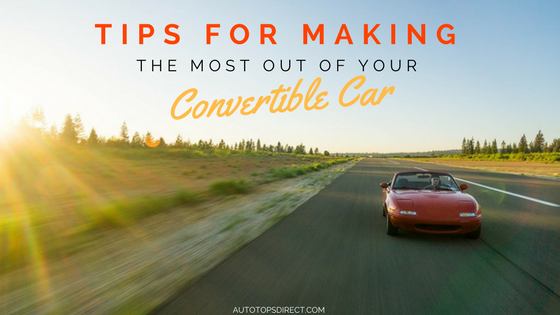 Summer time is officially the season of making the most of your convertible, since you’ll be riding around in it a lot more! Before you take your car out for a spin, however, we have a short to-do list of items you should check off before you officially unwind, roll down the windows, and enjoy the warm weather. Since your top is down while driving, the interior of your convertible will be susceptible to outside elements that could bring debris and potential stains inside of your vehicle. It’s vital to inspect your car’s seats, carpet and soft-top for any rips, leaks or “weak spots” after driving. Additionally, when you’re tucking your convertible in at night, be sure to carefully raise your soft top up a little bit to ensure the top deck and surrounding areas are clear of any small sticks, leaves or any outdoor “elements” that may have become stuck underneath. This type of debris or outdoor material can potentially cause damage to your convertible’s top, scratch its plastic window or cause splits in glass windows. While it may seem unreasonable or cumbersome, it’s important to remember that an easy fix, like a quick stain blot job, could very quickly turn into a larger and costly issue if you don’t remedy the situation at first sight! Whether you have a new convertible, one that is a few decades old or a vintage ride, protecting its interior is important, as we’ve discussed above. Since automobile upholstery can be quite expensive, or if you want to maintain the integrity of its original interior, we recommend you consider protective seat covers. Whether you opt for more affordable universal seat covers or custom-fit seat covers for your exact make, model and year, finding a seat cover in today’s online world is virtually painless and you don’t have to opt for uncomfortable plastic ones either. In today’s market, you’ll find easy-to-clean fabric, often a poly blend that is breathable and padded for optimum comfort. Regularly vacuuming and spot cleaning will also increase the overall longevity of your seat covers while protecting the original upholstery underneath. Drop tops are notorious for wind noise. A wind deflector or wind diffuser will make your rides much more enjoyable! They are effective in diffusing loud wind noise and turbulence. Essentially, a wind deflector attaches behind the driver’s seat and resembles a screen. Once attached, wind is actually diverted to the back of your convertible instead of travelling throughout and towards the front of your cabin. While there are many wind diffusers or deflectors for you to choose from, opting for a more durable material like acrylic can result in longer usage. Because this does takes some rewiring, we recommend turning to a professional! There’s a feeling of luxury and romanticism while driving a convertible. Couple that with the warm, bright sun on your shoulders and you have an indescribable experience! Where are you planning to take your convertible this summer? Let us know what you do to prep for the hot months ahead in the comments below!